What you see here is truly a work of art – the SKDubs Gold Boombox. Rarely has music and sculpture met in a whirlwind romance, but this one definitely ranks pretty much up there in terms of aesthetics as well as performance. 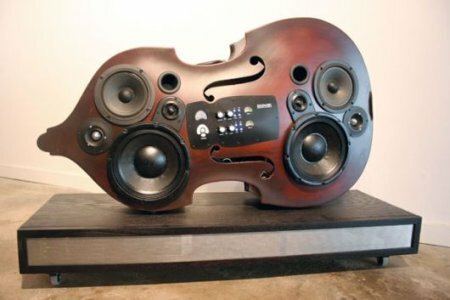 It is but a boombox that has been built right into a body of a double bass, courtesy of artist David Ellis. Features include a 4-way stereo speaker system, a couple of vacuum tube preamps, a Crown power amp, and a Behringer equalizer for some serious sound. The only thing missing for this generation? An integrated iPod dock – having that would make the SKDubs Gold Boombox score full points in my book, but that glaring omission leaves it at a 9 out of 10. There will only be three of these available, retailing for a jaw-dropping $15,000 each.